I know some of you prefer to win tickets to the Super Bowl (Go Giants!). Or, maybe you still haven’t landed tickets to the amazing The Book of Mormon on Broadway (I haven’t either). 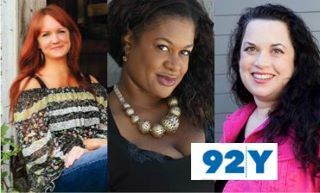 We can’t help you there but we can help you score tickets to the 92nd Street Y for a night of inspiration where you can hear some great authors and bloggers talk about the risks and rewards that we all face when forging new paths. The52weeks.com is excited to be a part of this great panel that includes Ree Drummond, an award-winning blogger, TV personality (have you checked out her show on the Food Network?). She is also the author of The New York Times number one best-seller The Pioneer Woman Cooks: Recipes from an Accidental Country Girl; Kathryn Finney, an amazing author, TV correspondent, fashion blogger and budget shopping expert who is best known for her blog, The Budget Fashionista; and Sarah Brokaw, a psychotherapist, philanthropist and author of the The New York Times best-seller Fortytude: Making the Next Decades the Best Years of Your Life — Through the 40’s, 50’s and Beyond. The panel is being moderated by Elisa Camahort Page, co-founder and COO of BlogHer, the web’s leading cross-platform media network and publisher for women, reaching more than 26 million unique visitors per month. Wow, we’re in amazing company. We originally launched the52weeks.com when we made a pledge to try something new, fun, challenging, or even ridiculous every week for a year. Well, as we’ve said again and again, life got in the way at times, but we still forged ahead. So far, our stories have educated, entertained or inspired many. In 2012, we are on a mission to inspire others to get better, get moving or just get over it! Now we want to hear from you. Tell us what you plan on doing this year that is just fun or different; maybe it’s something you used to do and you loved but you just stopped doing for no particular reason? Or maybe you have some fears that you just haven’t tackled yet? If you share just one thing on your list with us you can win tickets to our February 16 appearance at the 92nd Street Y — “Top Authors and Women of the Web Share their Stories.” So send us your funny, crazy, or inspirational to-do’s for 2012 and you will be entered to win tickets. It will also help us gather more great ideas for ourselves and our 52 followers. It can even be something “small” — or seemingly-small! Last year there were some weeks when we just changed one thing in our daily routines -eat more blueberries anyone? (They’re Not Just Blueberries). So help us out and tell us what you’re doing this year and maybe you will win some tickets…and, sorry, we just can’t help you on the Super Bowl! Want to go or just want to join the conversation? We have two pair of tickets to give away! How to enter: Tell us one thing new or different that you want to learn or try this year. Post it on Twitter (http://twitter.com/The52Weeks) using this hashtag: #unstuck (must have the hashtag to be eligible). Or you can enter via this blog at the52weeks.com@gmail.com. The Deadline: 11:59pm ET, Tues. Jan. 31. Winners will be announced on February 3. Congrats on your spotlight event! Sorry I missed it – it sounds like it was a huge success! !